Lower fatty acids such as butyrate and propionate can only be mineralized if two catabolic products of acetogenic bacteria, i.e. hydrogen and acetate, are consumed by methanogenic bacteria. The methanogens are very old microorganisms, living on earth since before the oxygen-rich atmosphere was formed. Methanosarcina and Methanothrix are able to grow using acetate for catabolism; and 70% of the methane formed in digestion processes and elsewhere in nature is produced via Eq. (8.4) (Jeris and McCarty 1965). Methanosarcina spp are the most versatile methanogens producing ATP from acetate (Eq. 8.4) and hydrogen (Eq. 8.5). Methanol and methyl amine (Weimer and Zeikus 1978) are further intermediate products which can be bio-degraded down to CH4 and CO2. Fig. 8.3 Electron microscopic photographs of methanogenic bacteria. 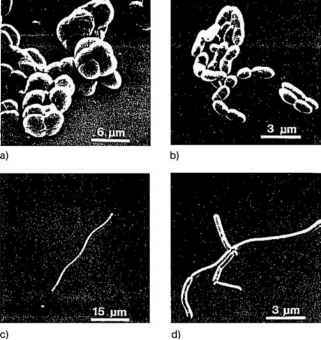 (a) Methanosarcina barkeri; (b) Methanobacteria ruminantium; (c) Methanospirillum hungatii; (d) Methanobacterium bryantii (Zehnder and Wuhrmann 1977). are able to produce ATP using H2/CO2 and formicate HCOOH, but both do not grow on acetate (Balch et al. 1979). H2/CO2-using Methanobacteria produce considerably more ATP than bacteria using acetate. They have a correspondingly higher maximum growth rate. Although only about 30% of all CH4 is produced from H2/CO2, Methanobacteria are very important for the regulation of anaerobic wastewater treatment processes. This will be explained in the next section. 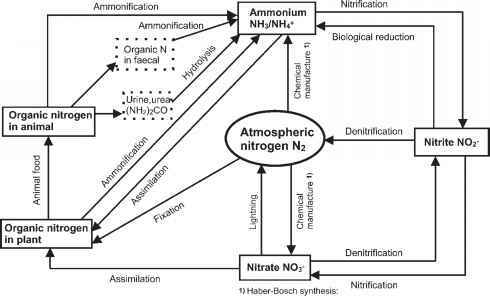 Detailed information about anaerobic bacteria has been published by Zehnder and Wuhrmann (1977) and by Zehnder (1988).